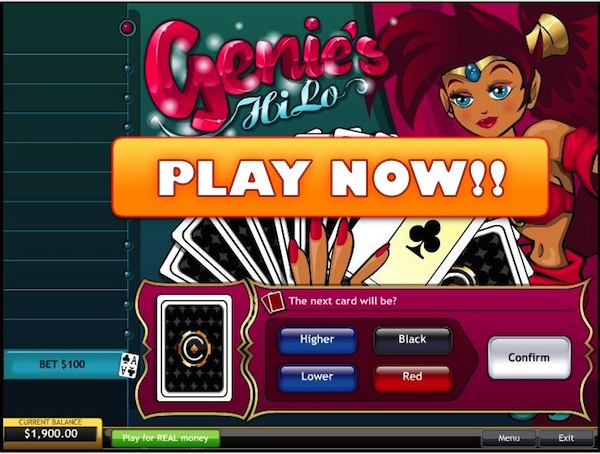 Genies Hi/Low is a card guessing game that is very similar to Hi/Lo Switch. However, there also are a couple of very different aspects. This one is developed by PlayTech and is a progressive game, meaning you can claim a jackpot which is build by you and other players who play this game. Another difference between this game and the ”Hi/Lo Switch” one is that the player interface is way different here. You see a ”genie” who holds 10 cards in front of you and shuffles them after every succesful guess. Unlike in most card games, there are no betting boxes to wager on in Hi/Low. This game is actually more similar to the arcade ones that seem to grow in terms of followers and players on a daily basis. You’ll start out with choosing the wager you are willing to risk in the next round. This can be anywhere between $0.10 to $100 at most PlayTech Casinos. One that is done, you’ll just have to hit the confirmation button and 10 cards will be presented to you by ”genie”. Pick one of them or if you can’t do it, use the ”autopick” feature. After initial card has been selected, you’ll be presented with four options to choose out from. Each will offer different payout odds, if you succesfully & correctly guess type of next card chosen. Higher – next card will be higher than the initial one. Lower – next card will be lower than the initial one. Select one of these options to view potential payout odds, should your prediction fulfill. You’ll have to confirm it once again and pick another card. Cashout – collect your winnings. Keep on playing – any payout odds will be applied to wins you have already gathered. To claim the progressive jackpot, currently at $16,000, you will have to win for 12 consecutive times. This might sound easy, but it’s far from that, which explains why there have only been 2 winners of this jackpot. You’ll also have to wager at least $5 as the initial bet to be eligible. You are now fully set for enjoying a great playing experience, while also having a shot at winning 5 figure progressive jackpot. There’s one thing left – finding the best casino to play Hi/Lo online. If you’re a new player, I would suggest Winner Casino. They offer $/£30 completely FREE, just for making an account. You won’t even need a credit card or anything else. Money will be credited to your account in a couple of minutes after signing up. Play Now – CLICK HERE! Experienced players should play at Bet365 Casino. They offer some really generous bonuses and promotions, including a $500 VIP Welcome Bonus. On top, you will be playing at one of the largest gambling sites in the world! Join Bet365 Now – CLICK HERE to Visit!